Every time I look at his tiny hands, feet, and sweet little face – I still can’t believe that he is our baby and that he is really here! His birth was such a painful but beautiful process. I would do it over again in a heartbeat! I knew before I was even pregnant with Liam that I wanted to have a water birth. I wanted my baby’s entrance into this world to be as peaceful as possible and having it at home would not only put my heart at ease but create a warm and inviting environment for baby Liam’s first few hours of life. I also wanted to do it naturally so that I could experience everything the way that God designed it to work. I didn’t want to inhibit the natural process in any way. My friend told me about her water birth and she explained that Mary Anne was one of the most requested midwives in Nashville so if I wanted to have a home birth with her then I needed to call as soon as I found out I was pregnant! So I did exactly that! I called Mary Anne as soon as I found out I was pregnant – my parents didn’t even know yet! (My husband, Stephen, knew but we weren’t telling anyone yet). Stephen was so supportive throughout the whole process and I didn’t even realize how much I would depend on him throughout labor! This was our first baby so neither one of us really knew what we were getting into! When I first started having contractions it just felt like I needed to poop – which I did – three different times in the middle of the night. The fourth time I just sat on the toilet and then thought to myself “I must not need to poop” and as I stood up – my water broke! After that I started timing my contractions which were not painful at all at this point so I thought I had at least another day before Liam would be born but God had other plans! I was so relieved when Mary Anne arrived – her calming yet assertive presence was very reassuring to this first time mom. I never felt like I was a patient the entire time that I was in labor. I just followed the lead of my body and Mary Anne kept on telling me that I was doing such a good job – those simple, positive words had a powerful affect on me! When the contractions started getting a little more uncomfortable, I made a “nest” in the bathroom floor, covering it with layers of blankets and pillows so I could rest between contractions. I wasn’t sleeping at this point – just resting my eyes and my body. When a contraction would start, I would get on all fours and roll my belly on the birthing ball and this provided a lot of comfort. Once the contractions started getting more intense I actually vomited three different times. I was trying to drink lots of water to compensate for that but that just made me have to pee all the time so I ended up just sitting on the toilet with my arms around Stephen’s neck while he sat across from me on the birthing ball. I actually think he might have used the birthing ball more than I did during labor! It was so wonderful just to have him there supporting and encouraging me the entire time. If he had been the slightest bit worried or questioning I would have doubted my ability to have Liam at home. Just having him there for me to physically lean on (basically trying to pull his neck off) or to rub my back and squeeze my hips during contractions felt so good! For me – it was very strenuous for him. I actually told him at one point that he would be sure the next day! And he was! 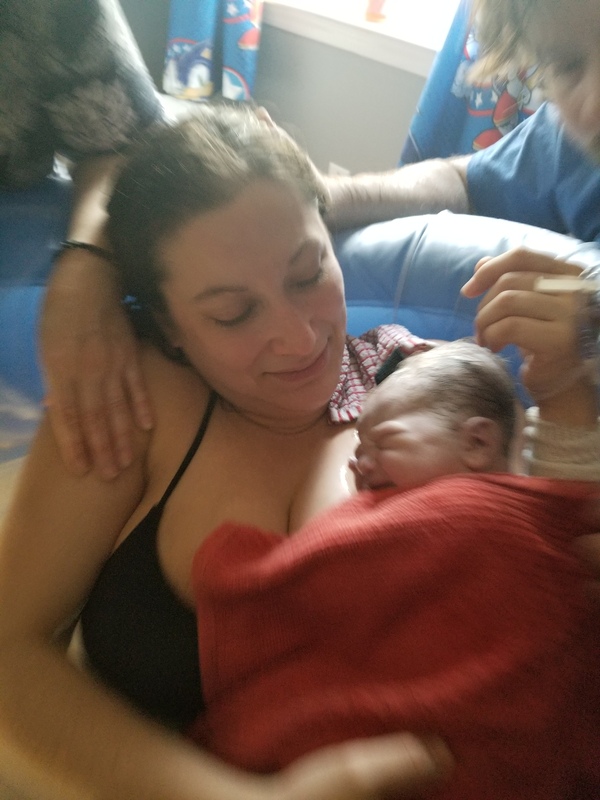 I did not get into the birthing tub until I reached transition (so it wouldn’t slow my contractions) and once I stepped into the water it suddenly dawned on me that baby Liam was about to be born! It wasn’t just a dream anymore! At this point I not only had Stephen, but my mom in the birth room as well. We chose to set up the birthing tub in the baby’s room and it was perfect. It was big enough for everyone who was not in the tub to be able to walk around the room but it was very intimate and cozy. I had created a playlist of worship songs on YouTube and we started playing it once I got into the birthing tub. It was amazing how many of the songs coincided with the moment! I did not hear the music most of the time because I was concentrating on remaining calm and diffusing the pain with techniques that I learned from Hypnobabies. But sometimes I would hear only one or two lines at just the right time. At one point, Stephen was pouring warm water over my back and I heard: “Oh your grace so free… washes over me…” the same song also says “life begins with you” and Mary Anne took a photo of the TV screen when that line played. I also remember hearing “I lift my eyes up to the hills, where does my help come from? My help comes from the Lord – the Maker of heaven and earth.” I don’t think that I have ever relied on God more than when I was in labor! At first, I was not really pushing with the contractions – I was letting my body (and gravity) do the work on it’s own. But after almost and hour of sitting on my knees in the tub Mary Anne suggested that I try a squatting position. This helped so much and when he started crowning I got to reach into the water and feel his furry head and that is when I realized that this baby was coming out right now! It seemed very surreal until that moment. Then I knew that we were going to get to hold our baby in our arms in a few minutes. And after a few more minutes of pushing (and yelling) he was out! I don’t even have words to describe the feeling of holding him on my chest for the first time. We were still both in the warm water and I felt like Stephen, Liam, and I were the only three people in the whole world! Stephen actually got to “catch” the baby (which he describes as “fishing”) and hand him to me. I was so emotional I couldn’t even say anything except for “Liam” while patting his little fuzzy head. He was so snuggly and soft and sweet. I couldn’t believe that he came out of me – he looked so big! He was eight pounds which was such a surprise to me! I don’t know where he was hiding because my belly never really got very big! It was such a precious moment when Stephen cut the umbilical cord. I didn’t feel any pain at this point – I just kept getting wave after wave of joy and love. I have never felt anything so strongly and purely before. I am so thankful to be able to have this experience at home for my first baby! I wouldn’t want it any other way!